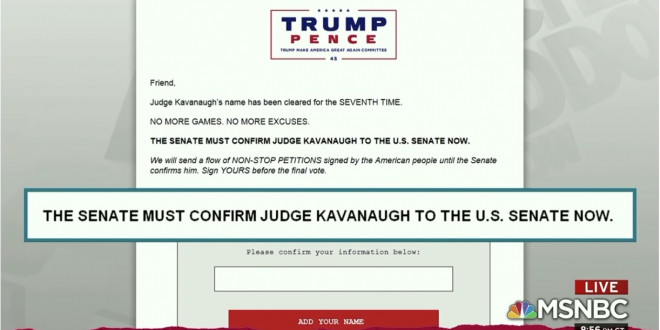 Trump Email: Confirm Kavanaugh To The Senate Now - Joe.My.God. President Trump’s reelection campaign sent an email to supporters Thursday night mistakenly urging for Supreme Court nominee Brett Kavanaugh to be confirmed to the U.S. Senate. The email asks supporters to pledge their support to Kavanaugh but makes a significant typo in just what they want to happen. “NO MORE GAMES,” the email reads. “NO MORE EXCUSES.” “THE SENATE MUST CONFIRM JUDGE KAVANAUGH TO THE U.S. SENATE NOW.” The final vote in the Senate concerning Trump’s Supreme Court nominee is likely to occur Saturday.